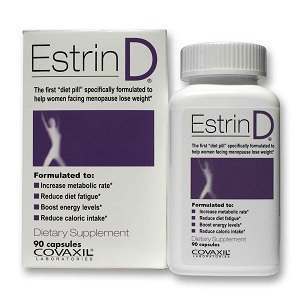 Estrin D is a stimulant-based pill that helps menopausal women lose weight, by improving hormone levels, enhancing metabolism and increasing overall energy levels. It reduces the production of hunger hormone ghrelin and reduces food intake. It also elevates mood and makes you look and feel good. The product has been found to be 16 times more effective for weight loss than a placebo in double blind tests. Xanthine – This is a caffeine-like stimulant that increases energy levels. Yerba mate, Guarana, Damiana (YGD) – Suppresses hunger hormone and decreases caloric intake. Vitamin B6 – Elevates mood, prevents depression and anxiety. Magnesium oxide – Essential for the health of the nervous system. It helps reduce depression, muscular spasms, nervousness, anxiety and is also required for absorption of calcium (for adequate bone density). Also keeps cardiovascular, digestive and excretory systems healthy. DHEA – Dehydroepiandrosterone is a precursor to steroid hormones. It reduces the risk of diabetes, obesity and breast-cancer and also delays ageing and degradation of memory. Caffiene, Green tea, Kola nut, Thea sinensis, Schisandra – Stimulants that enhance energy levels and keep the mind alert. Ginger root – Reduces hot flashes and nausea in menopause. Also helps lower blood pressure. Scutellaria root – Alleviates mood swings and depression. Tibetan ginseng root – Reduces overall menopausal symptoms. Restores vitality, reduces stress, hot flashes and sleeplessness. Cocoa nut – Elevates mood and reduces anxiety. Jujube fruit – Relieves anxiety, soothes the body and mind. It also contains ingredients important for hormone balance, and formation of bone, muscle, skin and enzymes. A 30-day supply costs $59.99 plus shipping and handling. If you opt for the auto-reorder plan, all future orders will be billed at $47.99. Since this product contains stimulants, it is not recommended for people who are sensitive to stimulants, have high blood pressure, hypertension, diabetes or heart diseases. The company offers a 100% satisfaction guarantee wherein they offer a complete refund if you are not happy with the product and return it to the place of purchase within 30 days. Is Estrin D worth Buying? This is not strictly a menopause supplement, but rather a weight loss supplement for menopausal women. Even though it is not technically in the same category as menopause supplements, since it does help in regulating hormone balance, we can compare it to them. Jackie Horowitz	reviewed Estrin D	on July 25th	 and gave it a rating of 2.